Students take either the SAT or the ACT during junior and senior year of high school in order to get into college. 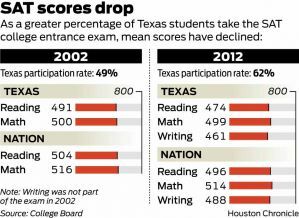 In Texas, more and more students are choosing to participate in this testing, but, unfortunately, their scores are falling. The College Board, who administers the test, released a report last Monday that show the national and state average for all test takers. Texas, just like many of the states, showed an increase in participation, but the state’s average scores fell by a much larger margin than the country’s average. These results show that while more Texas students are interested in higher education, less of them are prepared for the rigorous coursework. More than 60% of Texas high school students took the SAT, which is an increase from 58% last year, and fewer than half a decade ago. This isn’t very high participation though: Texas ranks 19th across all states for participation percentages. While average scores on standardized tests do typically decline as the number of students participating increases, the larger fall in Texas scores may signal concern with the number of students who are not college-ready in Texas. “Texas students, like those nationally, fared the worst on the reading section, scoring an average of 474 out of 800 points. The score dropped 5 points from last year and 17 points since 2002. Nationally, students scored 496 on average in reading, down 8 points over the decade. Across the nation, about 43% of students who take the SAT pass the college-ready standard, which was very similar in 2011. The college-ready standard is a sum score of 1550 on the Reading and Math sections . The SAT includes Reading, Math and Writing sections, each worth 800 points. Parents are urged to encourage students to take more Pre-AP and AP coursework, starting in middle school. Students should continue with the Pre-AP and AP courses that they are strong in throughout high school. Parents who are concerned about their child’s coursework choices or college-readiness should speak with a counselor or use the Contact Form to email Jolyn directly. My daughter enjoyed prepping for her SAT test with Jolyn. I really appreciated the personal attention she was given. I have known Jolyn on a personal level as well for a couple of years and would highly recommend her to work with your children. Note: Beth's daughter was accepted to Texas A&M University!